I really felt like steak tonight, and I really needed to use up some stuff in my fridge. Thus, this recipe was born. Quick, easy, and even if you had to buy the ingredients it wouldn’t be hard to assemble. Season steaks on both sides with salt and pepper, sear until cooked to your liking. I like medium rare, so for me that was about 3 minutes per side. 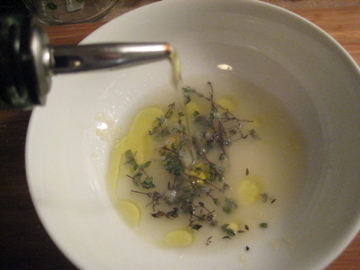 While steak is searing, put lemon juice, thyme, and a drizzle of olive oil into a shallow dish. 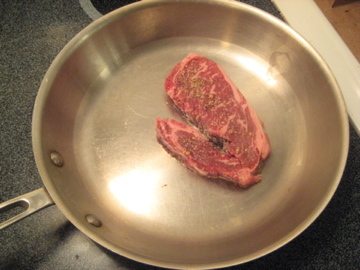 When steak is done, put steak in dish for ten minutes, turning once. You are basically marinating the steak backwards, which makes it extra tender and really flavorful. 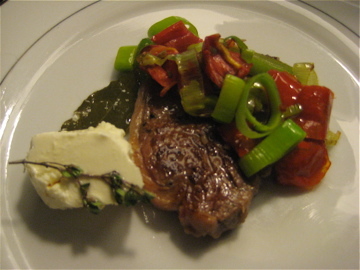 While the steak is marinating, saute the leeks and tomatoes in butter (or olive oil if you prefer) until soft. Serve over steak, and with a side of marinated feta. The saltiness in the cheese goes well with the lemony steak, and the bitterness of the leeks is balanced by the sweetness of the tomatoes. Voila! See there? Sometimes “cooking backward” is an unplanned plan. I was trying to find a website where I could insert ingredients I ALREADY HAVE and come up with something edible, possibly delicious.